The table below shows a series of dark frames with different exposure time and sensor sensitivity, taken at about 20 degrees room temperature. The camera settings were: (optimize image = normal, long exposure noise reduction = no, image quality = fine, white balance = direct sunlight). Except for scaling no image treatement was done. Between each exposure there was enought time to let the camera cool down. The camera was put into a dark room to prevent light getting through the finder or bajonet. Compeare also the tests about Nikon D70 sensor noise. 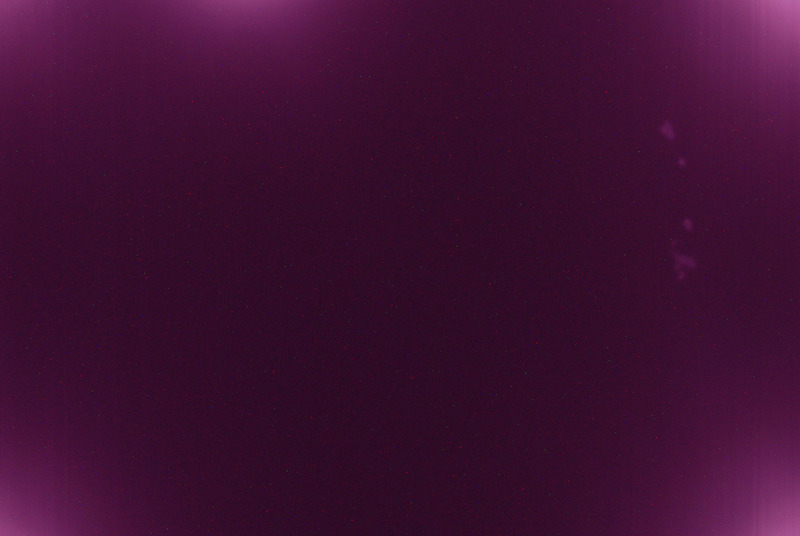 One can easily see that the due to heat of the electronics the corner of the images get pink bright. Some spots on the right hand picture side are interesting. The picture belo shows a dark frame of 30 minutes exposure time at ISO 400. Interesting are the few spots on the right hand side. They rather look like defects of the sensor than coming from heat. At "normal" exposure times these spots are not visible.